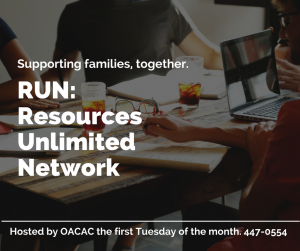 The Resources Unlimited Network (RUN) meeting provides an outlet for nonprofits to gather and share information and resources toward the mission of reduced poverty, strengthened communities, and increased self-sufficiency. The meeting is held on the first Tuesday of each month at 9:00 am in the Midtown Library lower level conference room, 397 E. Central in Springfield. Contact the OACAC Greene County Center for additional information at (417) 447-0554.